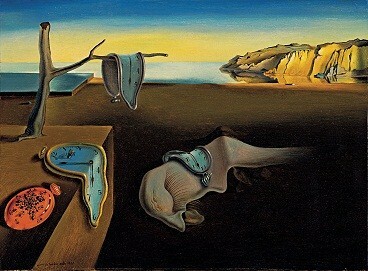 Do you ever feel like a melting clock? I do. I can relate to that one hanging from a branch especially. Yesterday I was fluttering around the internet listening to the girls play hide and go seek with Little Man. "Where you, baby? I finding you, baby!" I giggled a little bit at their sweetness. Then I started to notice all that was going on was looking. I had not heard any finding. "Did that baby find a good hiding place?" I questioned. The girls kept hollering for him, and I started to get a little suspicious. Where is that baby? Moderately alarmed, I joined the search for baby. There wasn't a whole lot of possibilities for his whereabouts in the finite space of the downstairs. And yet, I couldn't find him either. My heart started to race a bit, and my cheeks were getting flush. Where was he?! ... that's when I realized that I had put him down for an early nap. He'd been a monster all day, waking a full two hours ahead of schedule. So yeah, he was upstairs slumbering the entire time. As his mother, I'm pretty sure I should have remembered that. Especially since I was the one who tucked him in.